After much prodding by family members *Cough Julie* to make a blog, we have finally decided to give it a try. As we are now officially a month in, it seemed like as good a time as any to write our first post. Because a month has already passed, and most of you have been updated through emails already, rather than going back and writing long posts about what we have already done, we are going to start with a short summary post. Then, going forward, we will try to keep it updated as much as possible (internet availability permitting). 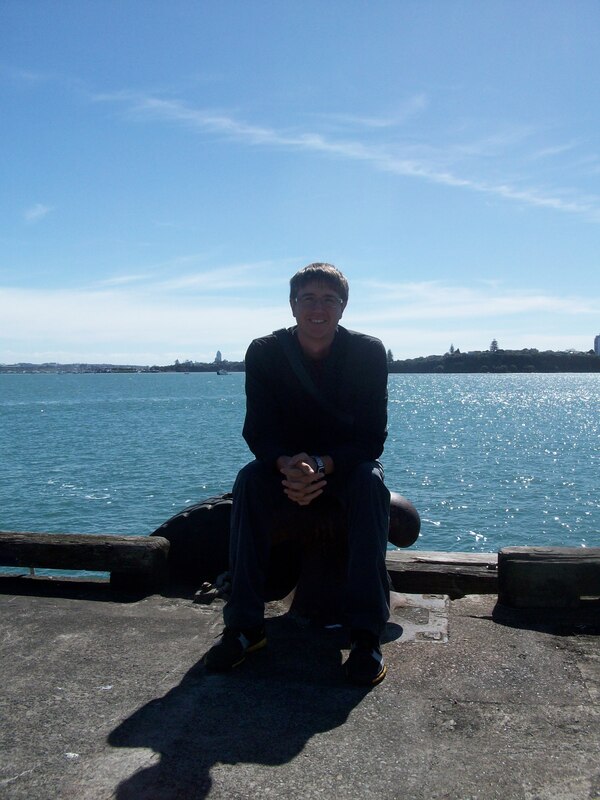 Our first stop was Auckland, where Kyle got his first real view of the ocean. This was a highly anticipated moment for both of us; however, the excitement of arriving in New Zealand could not compete with the jet lag from the journey, and the first day was spent napping and trying to get into a normal routine 16 hours ahead. We stayed in Auckland for the first week of our trip. During that time we stayed at Base hostel, Queen street backpackers, and one splurge night at a nice hotel. Auckland is like most big cities, lots of big buildings to look at, and lots of fast food chains to choose from. We did a few day trips suggested by Lonely Planet like trips to parks, museums, and an dormant volcano Mt. 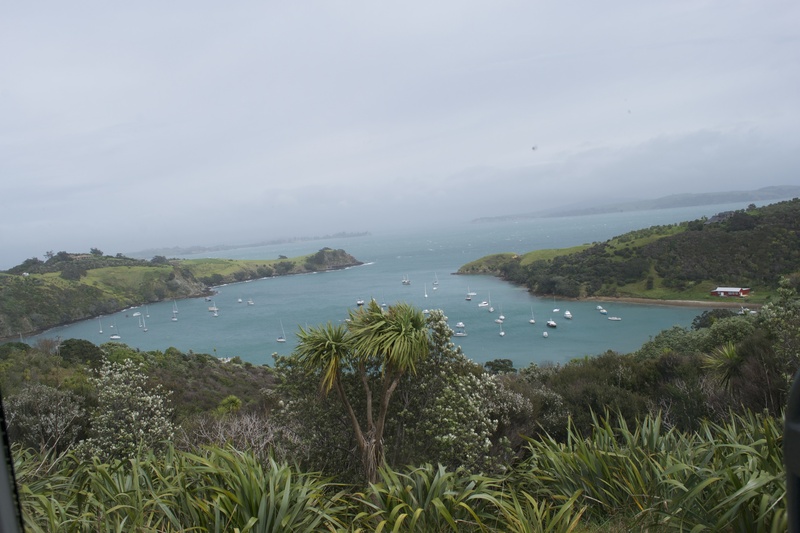 Eden, but the best day trip was by far the ferry trip 45 North East to Waiheke Island. 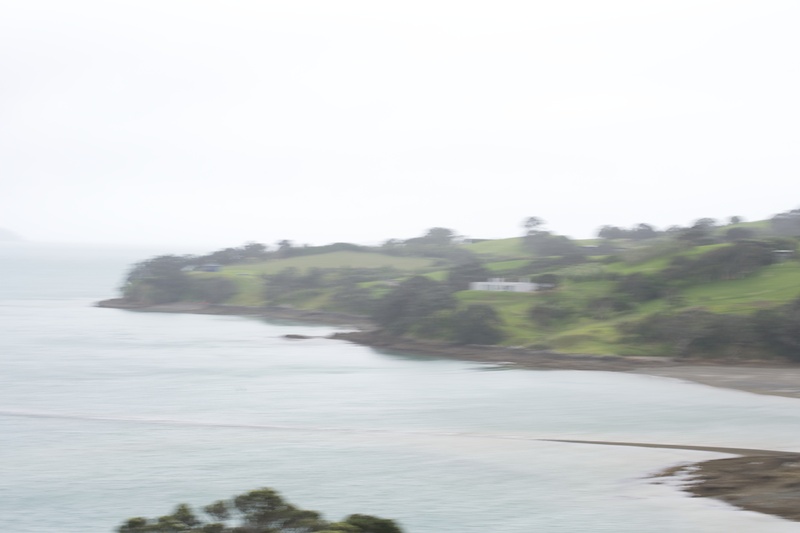 On Waiheke, we got our first taste of what walking through NZ would be like. HARD. The trails were not marked by difficulty, only estimated walking time. We chose a 4 hour track, and we were both wiped by the time we completed it. The views were worth it though, as it followed the coast line the whole time. While on the island, we also had our first taste of NZ fish and chips. And as we had earlier learned, in NZ you are never further than 130K to the Ocean, so they take their fish and chips seriously. We stayed in Auckland a little bit longer than we wanted to (we were really eager to get out and see some of the landscapes that had drawn us to NZ in the first place), but we needed to do an orientation, and set in motion forms to get tax numbers to work here. We found out that it would take up to three weeks to get a bank account and tax number to be able to work, so we decided to do “WWOOFing” . That stands for willing workers on organic farms. The pay is food and accommodation. We decided this would be a good way to stop the money slipping away, and set to work applying to farms. We had no idea how long it would take to find something, so we applied to dozens of farms, and accepted the first one to get back to us. Later that night, almost all that we had reached out to had responded asking us to come, so we have many farms on a list to potentially visit down the road. Kyle’s farm experience makes us an attractive pair. Our first wwoofing position was bringing us to Hastings, in the Southern part of the North island (and known as one of the sunniest spots in NZ). While making our way down to Hastings, we stopped in the tourist town of Rotorua for two nights. 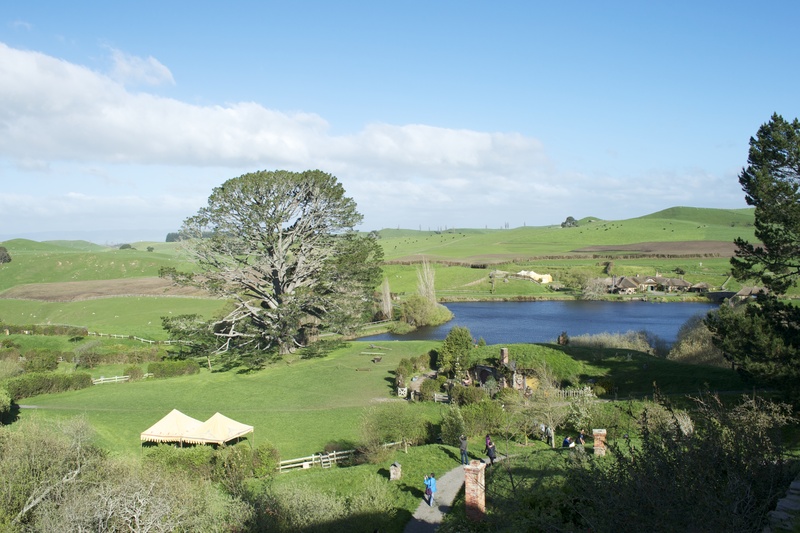 We booked three activities for while we were there, Rafting, a trip to Hobbiton, and a traditional Maori cultural evening. Our rafting trip was cancelled because of heavy rainfall, but the two other activities were wonderful. The Maori night was with a tribe called the Maitai (pronounced Mai-tee). They picked us up from our hostel and brought us to their reserve land. The night started with a welcoming of the tribe, and a selection of a “chief” to represent us. There was an Australian rugby coach in attendance (I had no idea who he was, but the Aussies there were all taking photos of him, so I guess he is a big deal). He was our chief. Then the dinner was lifted from the oven in the ground. 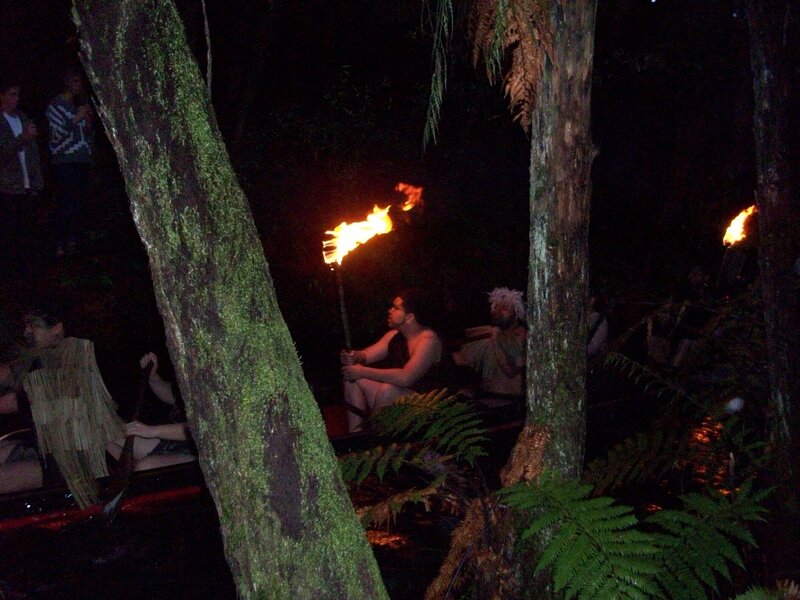 We then went into the woods where a waka, a traditional war canoe, was used for a fire ceremony through their sacred river. The dinner was an all you can eat buffet, and the night ended with a flashlight tour of the woods to see the glow worms. Kyle’s favorite part of the trip to Rotorua was our trip to the Shire. The setting for the Shire is in a small town called Matamata, which is a little over an hour drive from Rotorua where we were staying. The tour did not disappoint. When the directing team went back to do the Hobbit movies, they made the set out of permanent materials to preserve the site as a tourist destination, so everything was in really good condition, and just like it looks in the films. During the rest of our time in Rotorua, we took in some beaches, parks (generally just any free attraction), Rotorua is also known for being a geothermal hot spot, so there were a lot of interesting thermal parks to explore. We left Rotorua en route to Hastings, and the bus had a temporary layover in Taupo (another major tourist town). We had lunch on a bench by the lake, and quickly decided that we would need to come back and spend more time here. During our stay in Hastings (12 days) we stayed with the Monk family. They own an asparagus farm. Our jobs ranged from sorting asparagus, to packing, moving, and delivering it (no picking luckily, as that is apparently back breaking). 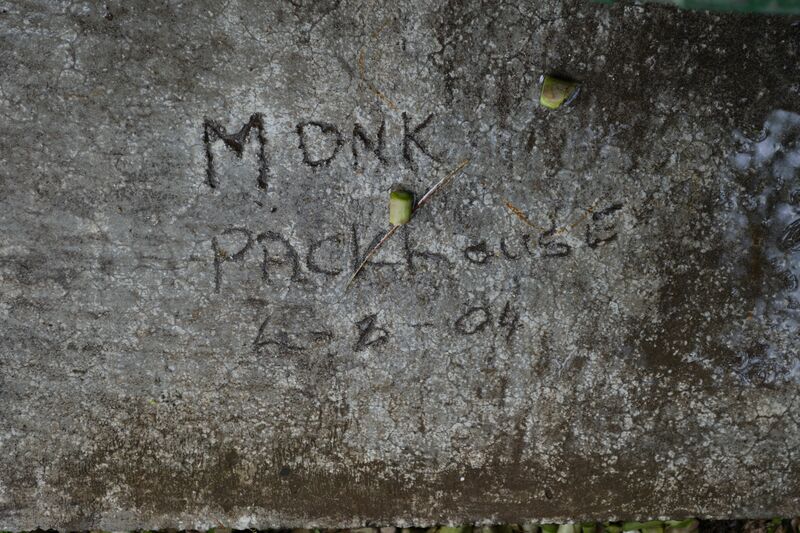 We had a wonderful time with the Monk family, and it was a great first wwoofing experience. The weather reputation of Hastings did not disappoint, and we had beautiful day trips into town, and to the larger city of Napier. After leaving Hastings, we were on our way to our next wwoofing job in Warkworth (just North of Auckland). We decided to stop in Taupo on our way there and based on the blog post of a fellow traveller we met in Auckland, we decided to spend our day doing the Tongariro Crossing, or, as Kyle prefers – visiting Mt. Doom. It was an incredible 20K walk up through the mountains. 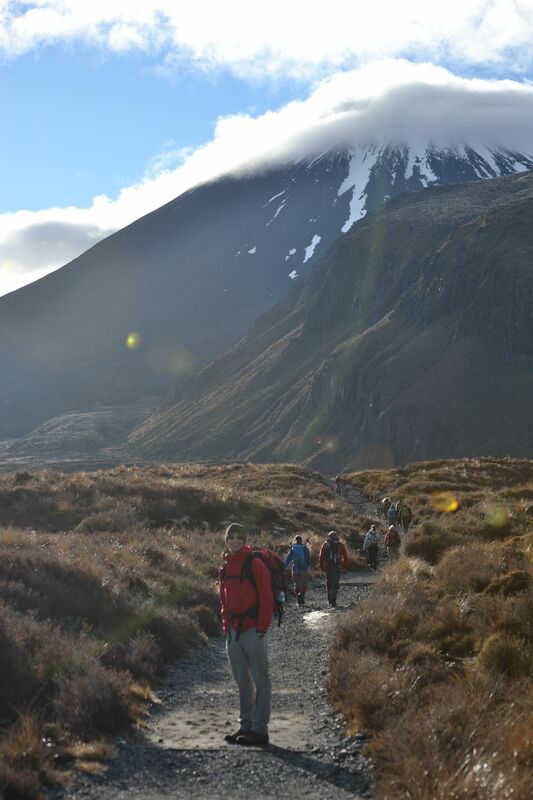 It is one of NZ’s ‘Great Walks’ -one of the few that could be done in one day. We had perfect weather (luckily, as several parts of the walk are rather treacherous), and had an unbelievable time. Our time in Taupo was much too short, but we needed to get back to Auckland to pick up our tax numbers which had finally come in. After a short one night stay in Auckland, we headed North to the Bullock farm which is where we are currently staying. The Bullocks own a 300 acre farm, with a primary business being calf rearing (they have over 150 here right now). They also have over 100 sheep, 18 horses, 3 dogs, 2 cats, a pet sheep, chickens, and a pig (& piglet). It is a completely different experience from the asparagus farm, but that is the fun part. We are moving around never leaving enough time to get bored, and doing a little bit of everything. We will update more about the Bullock farm in the next post as we try to update more frequently. It hardly feels like we are a month in, the time is already flying by. We are having a wonderful time, and enjoying everything that comes our way. We miss you all!